Just like vehicles, air conditioning units require regular HVAC repair and maintenance to keep them out of the repair shop and in great working condition. All HVAC systems have mechanical and electrical components that mean a myriad of things can go wrong; parts can fail, systems get dirty, and outside forces can cause damage. How much should air conditioning repair cost will vary depending on many variables. There are many signs that a homeowner’s air conditioning system is in need of repairs. But how much does AC repair service cost? Repair costs will vary by company, but all reputable and licensed specialists will perform an expert diagnosis before providing a quote. Bill Howe Heating & Air charge $65 for one of their expertly trained and certified ac technicians to perform a diagnosis service. What are some common AC repairs and how can homeowners tell if service is needed? When an air conditioning unit does not turn on at all, there are a few things that homeowners can check themselves before calling a professional HVAC specialist. Is the thermostat working? Sometimes, battery replacement is all that is needed. Check the breaker box. There are a lot of reasons that breakers will be tripped. Running too many appliances at once, especially in older homes, can cause breakers to short. Check the breaker box and reset the breakers. Check the thermostat settings. Is it set to cool? It can be easy to accidentally switch the settings. If everything checks out, it would be worth a call to the local air conditioning specialist for a diagnosis service. All companies vary on the process for a diagnosis. Bill Howe Heating & Air charges a flat fee of $65, but during peak seasons, appointments can book a week or two in advance. Poor or limited airflow could also be a relatively simple repair. The first thing a homeowner can do is check the filters. If they have not been cleaned or changed, they could be blocking some of the airflow. A kinked or improperly sealed duct can also be the cause of poor airflow, or in more serious cases, it could indicate the compressor may be failing. If the unit is 10 plus years old, a diagnosis may be needed. If dirty filters or ducting issues are suspected, a tune-up might be the best first step to clean the unit. During a tune-up, an HVAC specialist will clean and check for more serious issues. If the ac unit is not working at all, a tune-up cannot be performed, and diagnosis will have to be scheduled. Warm air coming through the vents instead of cool air is typically indicative of a capacitor or contactor issue, and luckily, these repairs can be made for a reasonable cost. Most times, the electrical components repairs will run between $250-$400. A spike in utility costs can indicate many issues, not just air conditioning usage. However, if you have gas services throughout the home, you can eliminate other major appliances. Reasons that an air conditioning can cause a spike in energy bills can be leaking ductwork and advancing age of the unit. When ducts are kinked or leaking, often the home does not cool as efficiently, and homeowners tax their system by turning it lower and leaving it running for longer than normal when not at home and cycling in an inefficient manner. Repairs can range greatly depending on the actual issue in need of a repair. If homeowners notice water pooling anywhere near an air conditioning unit, inside or outside, and/or frost or ice near the condenser outside, the system may have a leak. Leaks can be easy or major repairs, depending on the issue. If water is pooling near the condensing unit or condensate line, it could be excess condensation indicating a simple clogged line. This is usually an easy repair under $150. If the refrigerant is the cause, the repairs may skyrocket from there. If the refrigerant leak is in the coil, a coil replacement is fairly straightforward, but the leak could be anywhere in the ac circuit and difficult to find, causing labor time. When air conditioning units reach the ripe old age of 10, homeowners should take extra precautions to maintain and care for the system. If there are no frequent repairs, the system is probably in great shape. However, if things begin breaking down, it could be time to start thinking of an air conditioning replacement in the future. Depending on how well cared for the system is and how much strain has been put on it, an air conditioning unit should last beyond the 10-year mark and possibly up to 15. The wisest investment, aside from a quality system, a homeowner can make is routine preventative maintenance. 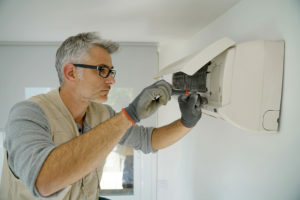 Not only is it required to keep the warranty intact, but it will also save on repair costs down the line and ensure the system works when homeowners need it most. Routine maintenance tune-ups can cost anywhere from $59-89, and often if homeowners schedule in the pre-season months, they can save money, as many HVAC companies will have available time slots before becoming booked with repairs over the hotter months. If homeowners want to set a maintenance plan up, they can also save with a pre-paid maintenance plan. At Bill Howe Heating & Air Conditioning, not only will homeowners receive the best system tune-up each season (once in the spring for the air conditioning and once in the fall for the furnace), they will also receive 15% off of repairs each year they have an active membership and reduced parts costs. And as an added bonus, Bill Howe will do all of the scheduling, so homeowners can set and forget, increasing customer satisfaction. No matter what the issue, homeowners should ensure they receive a full quote so they know exactly how much their air conditioning should cost. Diagnosis services are well worth the initial investment, but homeowners should always get a phone quote before scheduling, and make sure it is a no-obligation quote and that the HVAC specialist will provide full detail of the problem for estimate comparison when needed. At Bill Howe Heating & Air, we have specialists who are trained in expert diagnosis, and we have flat rate pricing so that customers have a transparent and settled cost prior to approval of repairs. Call to schedule your appointment today at 1-800 BILL HOWE (245-5469).